Welcome to those of you joining me from Heidi’s Head and those of you just hopping aboard. I am the 3rd stop on our Magical Blogorail. Magical Blogorail Green presents our Tips to Staying Cool at Disney! 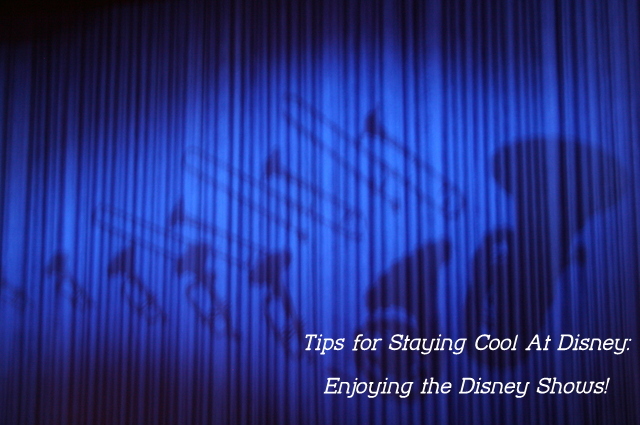 Hello everyone, thank you for joining us today as we explore our Tips for Staying Cool at Disney! With the summer Florida — and even California — heat exceeding the high 90s on a regular basis, it is our hope that these tips help you to enjoy your vacation while not running into any health issues! I’m going to talk about some of the great Disney shows that you can see to beat the heat! Mickey’s PhilharMagic at the Magic Kingdom. Mickey’s PhilharMagic is a great show that you can see in the Magic Kingdom. The beauty of this show is that it combines great Disney music with great movie scenes, and special effects! Plus, this show has an indoor queue line, and you can often get in to the next show. 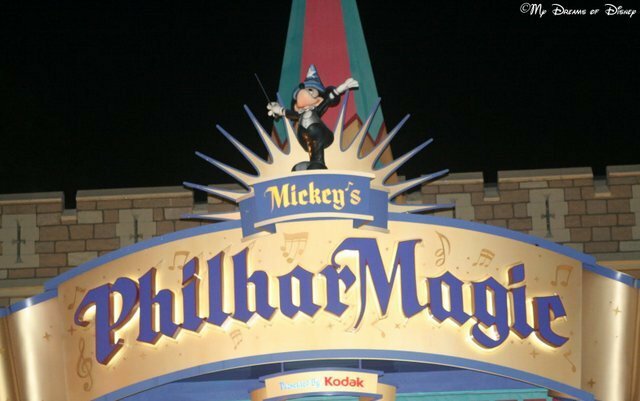 Surprisingly, this year we saw the PhilharMagic theater packed with guests to see the show — that was rare for us! 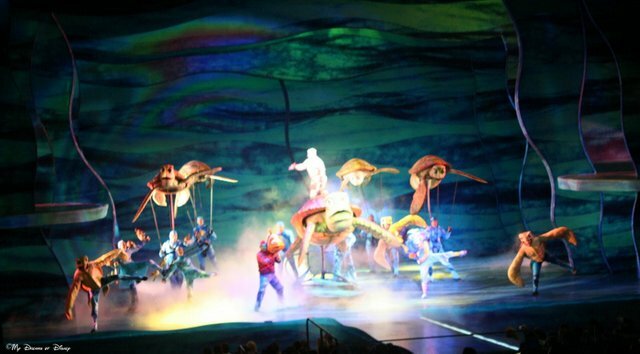 Finding Nemo – The Musical at Animal Kingdom. As you all probably know, the Animal Kingdom park can be one of the hottest parks to visit during the summer. One of the nice things about it, though, is that it features one of the best Disney Shows: Finding Nemo – The Musical. This theater is air conditioned, and with the show being as good as it is, you’ll be glad you decided to check it out! Voices of Liberty performs before the American Adventure Show begins! 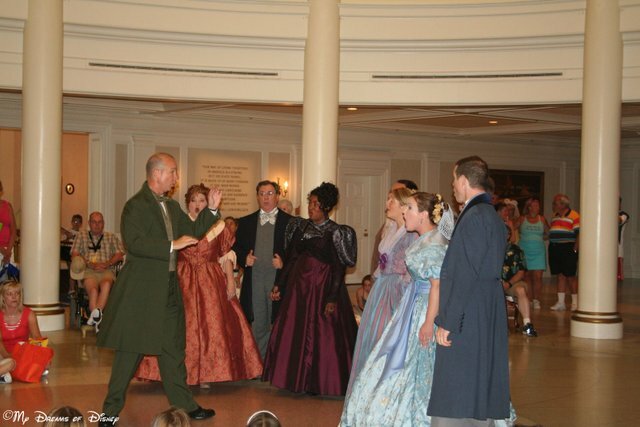 With the American Adventure pavilion in Epcot, you can see both a great singing group as well as a great show! Voices of Liberty is an incredible musical group, and you’ll enjoy hearing them if you haven’t before. On top of that, after they finish, it’s time to watch the American Adventure movie. This great movie is a wonderful way to beat the heat and enjoy a look at the history of America as well! 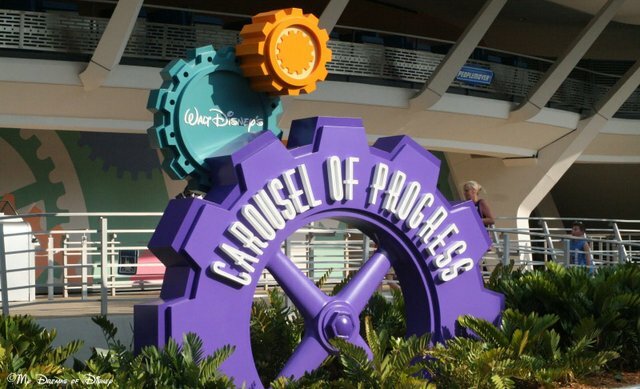 Walt Disney’s Carousel of Progress is located in Tomorrowland! Ah, Carousel of Progress. One of my absolute favorite shows to see at Walt Disney World. I know it’s a little out of date now, but it’s not the future of progress that I enjoy about this show — it’s the look at how things were in the past that I enjoy! Do you like this attraction/show/whatever it is? 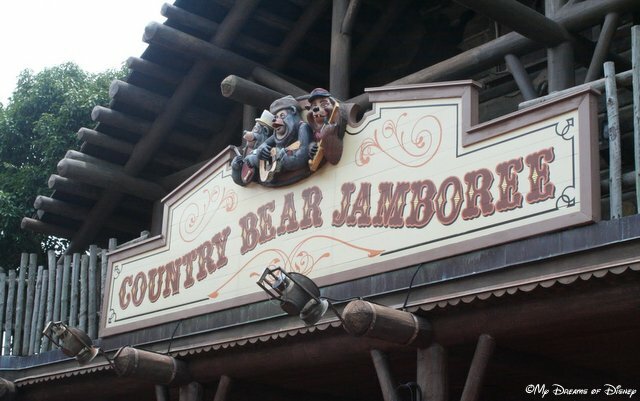 The Country Bear Jamboree is located in Adventureland at the Magic Kingdom! Our last show that we are going to look at is the Country Bear Jamboree. Located in the Magic Kingdom, this is a nostalgic look at a classic Disney attraction, an opening day attraction from 1971. With an air conditioned theater and lobby, this is a great way to beat the heat! 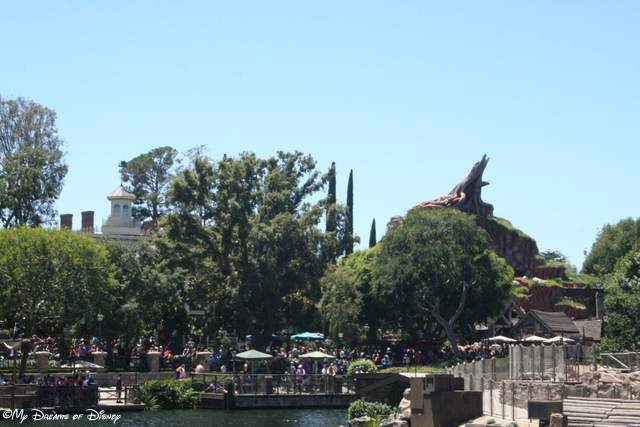 2nd Stop ~ Heidi’s Head – 5 Ways to Stay Cool on Hot Disney Days. 3rd Stop ~ My Dreams of Disney – Enjoying the Disney Shows! 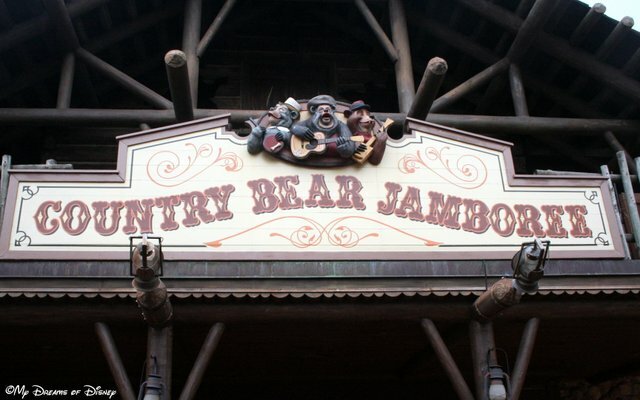 The Country Bear Jamboree is our choice for Day 85 in our #DisneyWorldCountdown. Hello everyone, and welcome to today’s #DisneyWorldCountdown post! 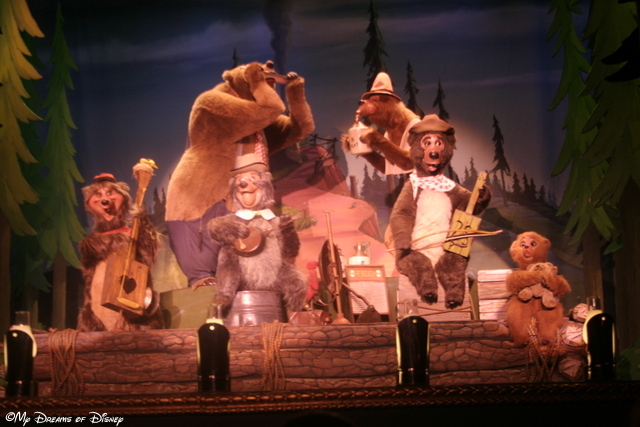 For today, we are sitting at 85 days until our trip, and we are taking a look at the Country Bear Jamboree! This is a down-home, good ol’ show full of country goodness! I’ve written about this show before, and to this day, the story of Walt Disney and Marc Davis is both incredibly sad and eery at the same time. For more details on that story, click on the link. 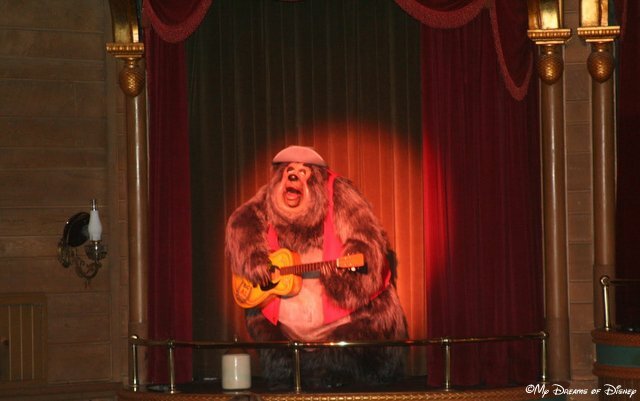 As for the Country Bear Jamboree, though, this is one of those shows that we don’t need to see every trip we go, but it is definitely one that I enjoy when we do see it. There’s just something fun about those singing bears and how they keep the audience entertained. Since this is a Disney World opening day attraction, it has earned my respect for being here for almost 43 years — that kind of staying power for a show performed by bears singing country and western music speaks for itself. Here are a couple of shots of the bears that I’ve taken over the years — I hope you enjoy them! Big Al serenades us with his out-of-tune guitar. 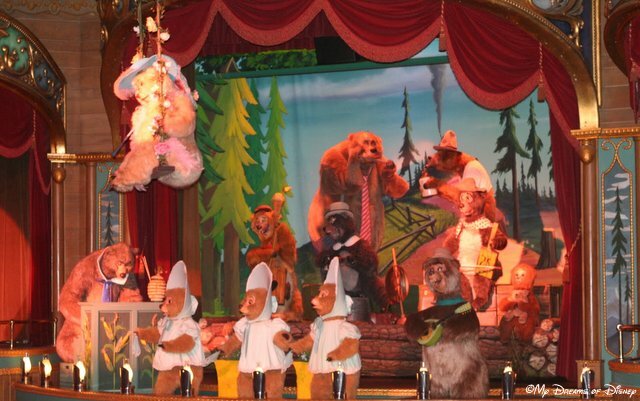 The Country Bear Jamboree bears perform together in their final song. As I said, this isn’t an attraction that I need to see every trip — but with our friends from California joining us, and our friends from North Carolina joining us also, I think that this is one that we might check out. Tell me, what do you think about the Country Bear Jamboree? Love it, can’t stand it, can take it or leave it? Let me know in the comments, please, and thanks for stopping by! When I first went to Walt Disney World, I thought I had to be at the head of the line for everything. So I arrived early for shows. Huddled by the entry doors of attractions. And ran to the rides. Many have done this thinking that it will give them ‘the best seat in the house.’ Or does it? These include: Space Mountain; Rock and Roller Coaster; Expedition Everest; etc. For these rides, you want to sit in the front car. However, you likely will have to ask to sit in the front car, and you may have to wait a little longer as others are let by you until all of the other seats are filled. Tip: There is one Roller Coaster that you do not want to do this for. Big Thunder Mountain Railroad is much more exciting for those who sit in the back seat. This comes from a Cast Member who gave me the tip after I asked for the front seat. He told me that the Train slows after cresting some of the hills, letting the front cars down the other side gradually until the rear of the Train crests. Then the Train is released and the thrills return. So the riders in the rear of the Train get a better experience. I did this, and he was right! Splash Mountain; Test Track; Soarin’; Mission Space; Maelstrom; Kali River Rapids; The Twilight Zone Tower of Terror; etc. all give a great ride no matter where you sit. First off, you will be told by the attending Cast Member of these Attractions that all seats are the ‘best in the house.’ And they are right, to a point. Every seat does yield an adequate view. But the principle I will be applying is based on my personal Movie Theater preference, which is: Always sit two-thirds of the way back from the front and dead center. Shows for which this principle should be applied are: Voyage of the Little Mermaid; Beauty and the Beast; Lights,Motors, Action! 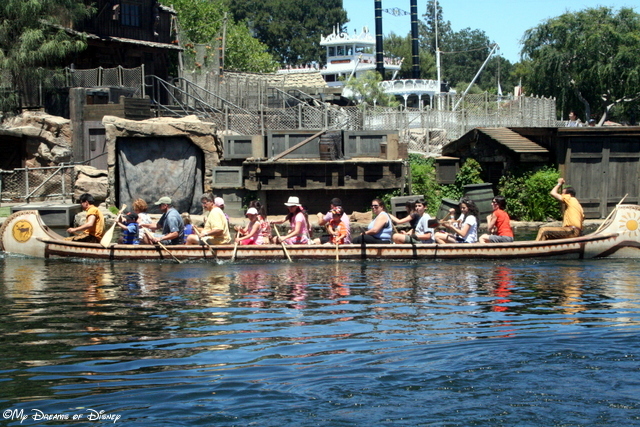 Extreme Stunt Show; Finding Nemo – the Musical; Fantasmic; etc. Playhouse Disney and the Festival of the Lion King, among others, give you a good view no matter where you sit. In fact, it’s best to choose a new seat each time you go. Shows like: Muppet Vision 3D; Country Bear Jamboree; The Hall of Presidents; Mickey’s Philharmagic; Monsters Inc. Laugh Floor; Carousel of Progress; It’s Tough to be a Bug; etc. are all examples where the ‘hold back’ approach is not needed. Truly, any seat in the house is perfect. Tip: Because all seats are good, you don’t need to rush to be the first in the door. You can relax and enjoy the pre-show or the queue area, or even mill around outside the attraction until just moments before the doors open. These rides or shows: Main Street Vehicles; Walt Disney World Railroad; The Haunted Mansion; Jungle Cruise; Star Tours; The Enchanted Tiki Room; Peter Pan’s Flight; The Many Adventures of Winnie the Pooh; It’s a Small World; Buzz Lightyear’s Space Ranger Spin; Stitch’s Great Escape; Spaceship Earth; Universe of Energy; The Great Movie Ride; Dinosaur; Gran Fiesta Tour; Pirates of the Caribbean; etc. all give you a good view no matter where you sit. In a new series “Exploring the Shows”, I’m taking a look at all of the different shows throughout the Walt Disney World Parks. In today’s episode, I’m going to take a look at all of the Magic Kingdom Shows. As I have previously written, Mickey’s PhilharMagic is one of our favorite shows. I’m a Disney music junkie, and I absolutely love all of the great music that Mickey’s PhilharMagic brings us each and every time we see the show. I have never gotten sick of hearing music from The Lion King, Fantasia, Beauty and the Beast, The Little Mermaid, Peter Pan, and Aladdin, and I don’t think I ever will! Top it off with the reaction Sophie always gets when Donald get’s in trouble, and you’ve got quite a show! Cindy and Sophie are not much of a fan of the Country Bear Jamboree, but I like to watch it every two or three years or so. 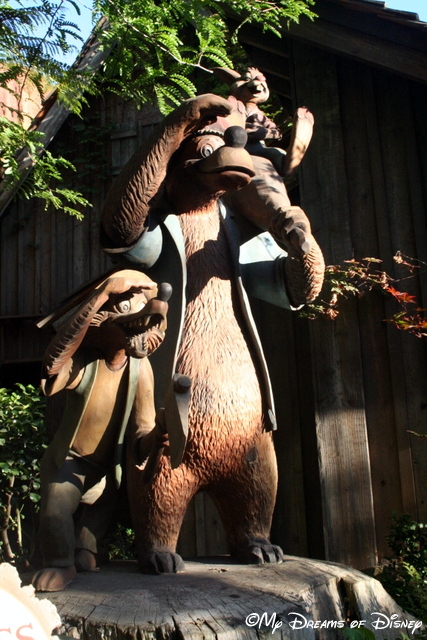 I like it because of the Audio-Animatronics bears, I like it because of the music, and the “show” that they put on for us, and I like it for the air conditioning and because we can always walk right in without a line. However, I can also certainly understand why Cindy and Sophie aren’t big fans of it, since they don’t like country music. 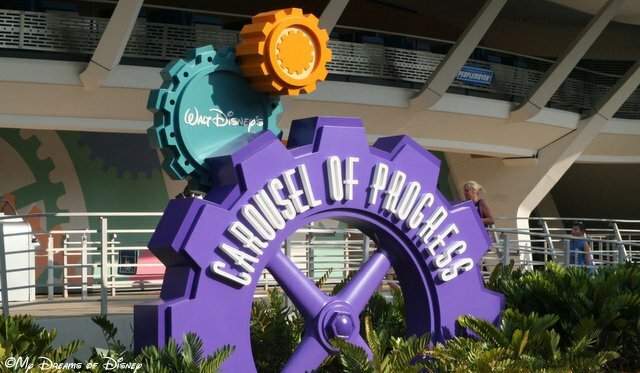 The Carousel of Progress is one of my favorite shows/attractions at any of the Walt Disney World parks. I am continually fascinated by the telling of how technology has advanced throughout the years, and Disney does such a great job of telling that story! Couple that with one of my favorite Disney songs “It’s a Great big Beautiful Tomorrow”, and I’m hooked! The show hasn’t changed much over the years, but to me that is part of it’s timeless charm. Also, when I think about how this attraction was featured at the 1964 Worlds Fair, and that just provides the icing on the cake to me. Well, part of the charm of Monsters, Inc. is that you can text a joke into a special number, and they might pick one and use during the show! I texted in Sophie’s joke, and they used it! It was so funny because when they had read the joke, Mike (I think Mike had read it) looked at all of us and said, “I don’t get it either.”, at which everyone laughed! For me, I like historical subject matter, and Disney does a really great job at the Magic Kingdom particularly, of incorporating a great review of history with having a lot of fun. 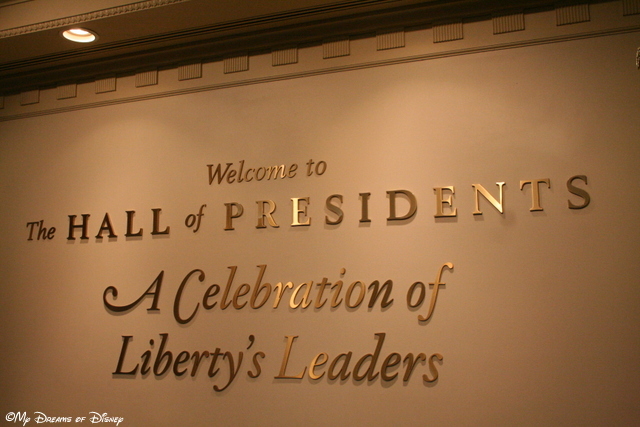 One way that they do that is at the Hall of Presidents. This show almost never seems to be busy when we go to visit it, yet it is one of our favorite shows. I would say that we see this attraction at least once per visit. It has a lot going for it; it is an indoor attraction to escape from the heat; it has Audio-Animatronics of every president our nation has had, and it has an entertaining way of teaching us about the history of our country. The Enchanted Tiki Room originally opened as Tropical Seranade when the Magic Kingdom opened it’s doors over forty years ago. After a run of several years, Tropical Seranade was closed and re-opened as The Enchanted Tiki Room – Under New Management. To be honest, I don’t even remember Tropical Seranade, but I never had any problems with the new management part of the Tiki Room, I thought it was a fun little show. I know a lot of people didn’t like it though. 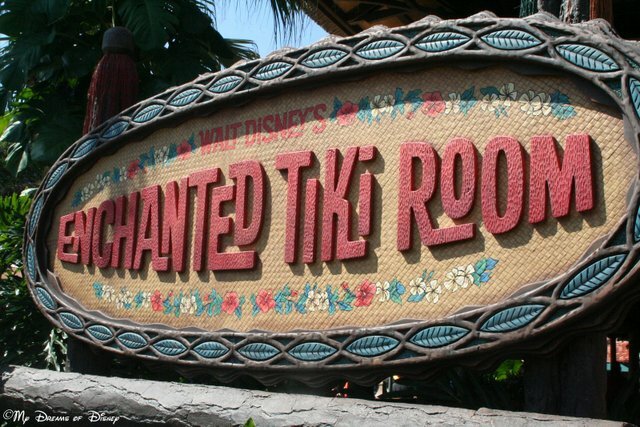 In January, 2011, though, a fire started in the attic of the Enchanted Tiki Room, and the show was closed for several months. It re-opened in August of 2011, and Disney has announced that it will be back to it’s original, non-New Management version. I look forward to seeing it in the future, and deciding for myself which version we like better! I hope that you have enjoyed exploring around the Magic Kingdom, looking at all of the great shows that Disney has to offer there! Tell me, which is your favorite show at the Magic Kingdom?